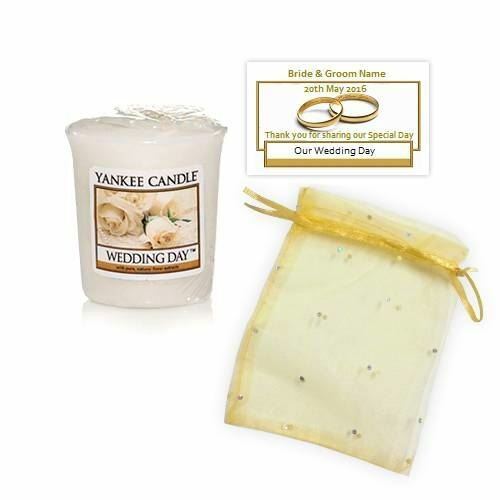 We get many requests for Yankee Candle Wedding Day votives to be used as favours for weddings, so we have now created a value priced option that includes Organza Bags & personalised labels. Due to the popularity of this package, we can offer a superb price of just €1.75 per votive including organza bag and additional personalised label even if you have a small wedding! Considering most shops charge over €2.50 for just the votive and organza bags being over €4 for a pack of 10, this is an unbeatable price and is all inclusive. Order 80 or more and a further 10% discount applies. Our standard personalised labels are 55mm rectangular labels and can have photo included if you wish - normally we use entwined hearts/rings as an image. All this for just €1.75 per votive (or €1.58 when you order 80 or more) and the minimum order is just 18! Please note that due to labels being required, orders can take up to 7 days to be completed though we normally complete the order with 2-3 days. All parts of the order are packed individually to allow you choose where the label is applied.